This couple have it right. They prioritised the important things – each other, family and friends and a place that meant a lot to them. Before the ceremony their friends and family were preparing the village hall with flowers, draping it with material, fairy lights and tissue paper pompoms, eating delicious Cornish pasties while the kids ran around having a ball. Friends set up camp in the field next door. 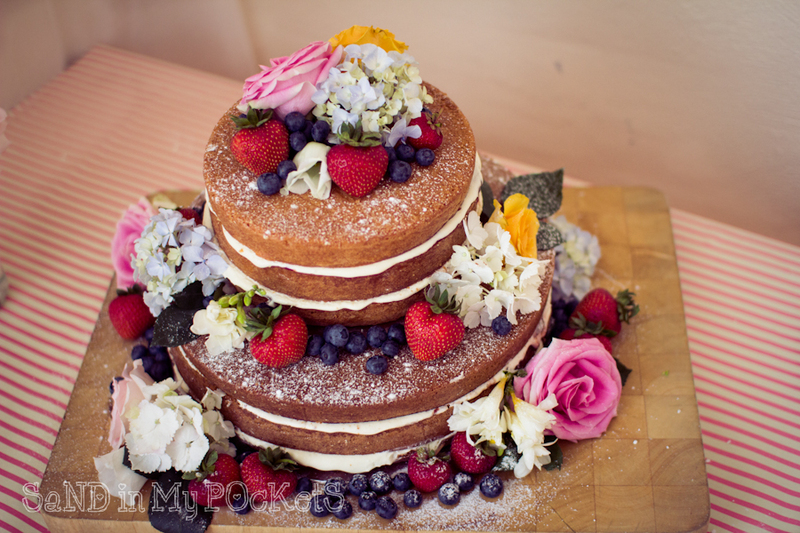 Everyone commented on the stunning cake, decorated with fruits and flowers, which was made by one of her very talented sisters. 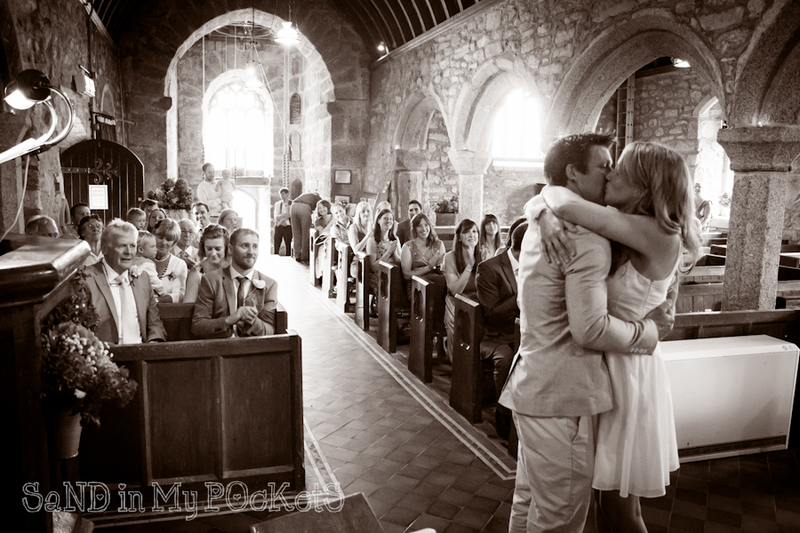 The village hall, pub, church and guest house were all a stone’s throw from each other, which I think can really help make a wedding so much more relaxing and enjoyable for everyone involved. Katie chose a simple yet elegant dress from Karen Millen and when the day warmed up she was glad she had gone for something so comfortable and she looked absolutely gorgeous. They had an intimate ceremony in the little St Senara’s church and signed the register sitting on the famous ‘Mermaid Chair’. After a drinks reception in the village hall the sun was shining and everyone made their way to the pub garden for more drinks and chat and a very pleasant afternoon for all. I was very impressed with their wedding rings which were made by Hannah Louise Lamb Jewellery, showing the outline map of the coastlines where they were from. She also makes personalised jewellery, including cufflinks, with city skylines and coastline maps so I recommend other brides-to-be to check them out. Katie did not want all the traditional group photos to take away from their day so we just had a few more relaxed ones and one large group shot of everyone. I did sneak off with the newly-weds down the path towards the coast and the magnificent Zennor Head to let them spend a few moments alone and capture some shots of them together. More guests arrived and they had a Hog roast in the village hall and a local ceilidh band ‘The Newlyn Reelers’ who did a fab job of getting everyone dancing, even very little kids. The next day, campers awoke to glorious sunshine and I took a wander down to the coast to see the stunning views from Zennor head itself.